Ningxia (宁夏) is the smallest and newest province in China. This province was created as a Muslim Autonomous Region for the Hui minority people in 1958, even though over half of the Hui people live outside of Ningxia. The Hui people are the descendants of Muslim traders that came over the Silk Road starting in the Tang Dynasty. Today, most Hui have interbred and assimilated with Chinese to the point that it is almost impossible to tell the two populations apart, on the surface. Ningxia is one the poorest provinces in China and almost all the wealth is concentrated along the narrow Yellow River Valley, in the northern part of the province. The main claim to fame for Ningxia is the Xia Dynasty. The Xia Dynasty existed alongside the Song Dynasty from the 10th to 13th centuries. The Xia Dynasty was a Buddhist kingdom created by the Tanguts, which were a group that was kicked out of the Tibetan Plateau, with its capital located near present day Yinchuan. 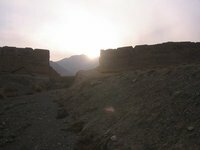 The Xia Dynasty is responsible for the creation of several thousand Buddhist statutes, grottos and temples across northwest China in Gansu, Qinghai and Xinjiang. Although these Buddhist sights are impressive, the main achievement of the Xia Dynasty was the creation of the XiXia Tombs outside of modern Yinchuan, where the royalty of the dynasty was placed to rest. The Xia Dynasty was pretty much destroyed by the Mongolian expansion in the late 13th century. Although it is believed that certain aspects of the culture might have survived for another hundred years. Most of Ningxia is desert except for a few forests located on the steep slopes of Helan Shan. The Yellow River cuts across the north of Ningxia and is the major economic pathway for the province. The chief mountain range is Helan Shan, which is in the northern area of the province, while there are also some smaller mountains in the south. In the southern areas of Ningxia, the desert, without a major river valley, is harsher than in the north. This area of the province is very under populated with only a few Muslim villages, one decent-sized city and abandoned ancient cities. Ningxia shares domestic borders with Shaanxi, Gansu and Inner Mongolia. Yinchuan, is the capital, largest city and home to the XiXia tombs. Bayan Hot although in Inner Mongolia, this Mongolian city is easier accessed from Ningxia province. Zhongwei is a nice city with several desert attractions. Guyuan is an interesting city in the desert with a good county museum and the jumping point to the Xumi Shan. As a Muslim Autonomous Region, all major and minor Islamic holidays are celebrated with schools and banks being closed for them. With 70% of the population being Han Chinese, all Chinese holidays are also celebrated. Ningxia has a desert climate with mountains and the Yellow River valley running through it. In the summer, temperatures can reach up to 40 °C, but thanks to the dryness, people barely feel it, especially in the shade. Temperatures can drop drastically at night due to the lack of humidity. The winter months can have some very cold days, but usually winters are pretty mild and nice. Dehydration occurs easily due to the dry climate. Because of the dry weather the traditional homes of Ningxia where built in man made caves, and some of these homes can still be seen in the southern areas of the province. The easiest way to get to Ningxia is to take a train, bus or plane to Yinchuan. Unless you are coming from South East Gansu, then take a bus to Guyuan. The only airport in the province is located in Yinchuan. Several train lines cross Ningxia, although most stop at weird times unless go to and from Yinchuan. Presently there is only one airport located outside of Yinchuan. This airport serves all major cities in China and many smaller towns in nearby provinces. Two major train lines serve Ningxia, although the lines are primarily used for freight. If you’re planning to use the train just to reach Yinchuan you should be fine. On the other hand the smaller towns tend to have trains arriving and leaving at odd times. This is "noodle and meat on the stick" country. Just walk into any crowded noodle stall or night market and try some of the amazing local fare. But be prepared, the locals like their food spicy. Mutton is the meat of choice for most of the dishes. This is version 28. Last edited at 10:41 on Dec 19, 16 by Utrecht. 10 articles link to this page.